As a general term, web analytics means the analysis of the relationship between a website and the users of that website. However, in the field of web consultancy and e-commerce, web analytics has a field/industry specific meaning, which we will be covering in this section. When e-commerce began to emerge as a significant industry, it came with its own sets of needs, requiring professionals who could measure the effectiveness of strategies, the current state of affairs that a website was experiencing, what the demographics and demands of a website’s users were. Most of all, as the internet grew, so did what we now call Big Data. To meet these new challenges and needs, a new field of expertise and knowledge evolved called Web Analytics. 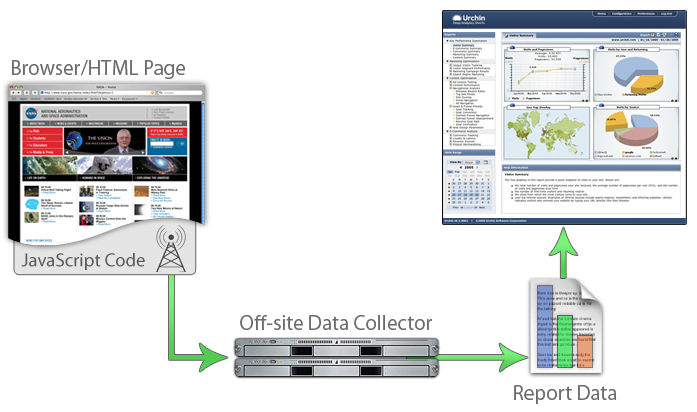 A major part of this new domain of information technology was the software used to measure and conduct web analytics. These genres of computer programmes and tools were instrumental in monitoring the relationship between websites and their users, the two poles in a dynamic relationship, which is the basis of web analytics. Web analytics is the activity that will provide information about different aspects of a websites, as well as help you answer some of the questions related to the traffic and overall performance. The route involved in bringing different categories of traffic to the website. E.g., how many arrive through search engine results, how many get to the website through online marketing? What terms are trending on the search facility on the website, what are users searching for and in what quantity? What category of users searches for particular keywords or search terms? What is the average, minimum and maximum time being spent on the website by users? How many users are going beyond the main page, to deeper links? What are the links attracting the most second clicks beyond the homepage? What is the bounce rate? How many users arrive at the homepage and leave website? All of this information has to do with user-experience and understanding it, optimizing it and troubleshooting areas where a website is not delivering what it is intended to and is not resulting in the kind of traffic revenue or user activity that a site owner wishes to see. This is the essence of web analytics; helping a website to meet the demands of users and the objectives set forth by the site owner. As you can see, all the above questions require monitoring, collection, classification, interpretation and finally, analysis of vast sums and types of data that is usually raw statistics, which need to be brought into a meaningful context. That is a job for the web analyst. At this stage, we can define that as a highly internet-literate individual who is required to contribute his expertise in four major domains; the creation of data entry procedures; ensuring the security systems of a website are sufficient and effective; thirdly, maintaining and managing the integrity of data; and lastly (and perhaps the most important) analyzing the data generated by the operations of the website and its interaction with users. When the internet began in 1991, web analytics were very basic and not possible in real time. You might remember seeing one of those counters that read ‘You are the 15,614th visitor to our website’ or something like that. The list of things we could measure, with some degree of accuracy, was rather small. Web strategists in those days basically shot arrows in the dark and that is why what we now call the ‘Internet Boom of the 90’s’, was really like a blind gold rush. If you somehow found traffic, you struck gold and on the contrary, you could have valuable content and due to lack of the ‘right’ promotion and proper optimized visibility, your website could lead to financial ruin. Then came 1993, bringing along with it the first step down the path of what IT professionals, marketing people and web strategists together know as web analytics. The year 1993 brought WebTrends to the world, the first web analysis tool that shaped the concept of what we call the ‘user’ now, and it was designed to keep track of records and analyze the behavior of users on the internet. This was not just an act of software pioneering but a shift towards the avenues of completely new philosophy or paradigm in our idea of what the internet is or should be and can be. That shift was a focus or centring on the user, the user’s experience, recording user activity, understanding the patterns of user behavior and creating strategies through analysis of the relationship that the user had with websites. This single thought or idea is what would later become the basis for the field of web analytics. So 1993 was, in a sense, the year that the basic technology and the philosophical grounding of web analytics entered the global internet community. Before we move on in our chronological journey into the history of web analytics, let us remember that web analytics originally was a sub-domain of the IT industry. But it was not long before the people in marketing, the traders and businessmen in commerce, the consultants in finance, web strategists and now more specifically SEO professionals, realized the wealth of utility, insights and possibilities that web analytics held. If you talk about web analytics in the early 1990s, marketing or commerce did not have it in their dictionaries. Web analytics has evolved over time to become a field in its own right and a specialization that requires specific knowledge, background and skills. Now back to our chronological tour through the history of web analytics. The first form of web analytics was perhaps basic log files that, at the time, had no marketing or commercial value or contexts attached to them at all, and were just a resource in possession of and maintained by the IT departments of businesses or organization. It is difficult to say when, where or how, but somewhere down the line, marketing departments began to see the potential possibilities that such log files held for understanding consumer behavior. However, it goes without saying that there was not much informational or in-depth research to what these log files contained at the time. Nevertheless, the point is that the link had been made between commerce and the archiving of user activity on the web. This was a naturally prize-winning find and a godsend for marketing and research, instead of traditional market research, where the company literally has to hound the consumer for information and be careful not to annoy potential customers. Here, with analysing user behavior on the internet, you basically had your consumers under a microscope, a setting which was, for the most part, controlled and comprised of precisely adjustable variables. All consumer activity was archived by default and there was no need for strategies to bait the consumer into giving you some time and information, since the very presence of a user on the web generated data. On a tangential note, insights of this nature had repercussions for website design and content development in a major way as well. Marketing was not the only contender for the progression in web analytics. Web analytics were starting to be understood as the internet looking back at its self – a virtual mirror that could be customized to the needs of what the analyst was looking into. These early advances in web analytics were indirectly responsible or at least contributed to giving rise to the user-friendly and user-centric philosophy of development, which is making a comeback since Google’s Panda and Penguin updates. Exactly around this time, in the summer of 1995, what was later to be known as Google Analytics, came into the cyber world, in the form of a software by the name of URCHIN. 1995 is highly underrated for its importance in the history of marketing, e-commerce, web analytics and the internet as a whole. Although URCHIN would not be bought, revamped and rebranded as Google Analytics until 2005, a decade later, history had already been made that summer. URCHIN was made available free to anyone who owned a website and once injected into the cyber bloodstream, it changed the World Wide Web for good, resulting in over 90% of page views being tracked, archived and analysed, as opposed to only 30% of partial tracking and readings pre-URCHIN. The end of the 90s and the beginning of the 2000s saw the official rise of big data and the integration of web analytics into the mainstream in four major industries: marketing, information technology, online publishing and lastly and most importantly, e-commerce. What started out as a simple tally counter to measure how many people set their cursors on a website became one of the most refined and sophisticated practices, sought after by every business small or large. 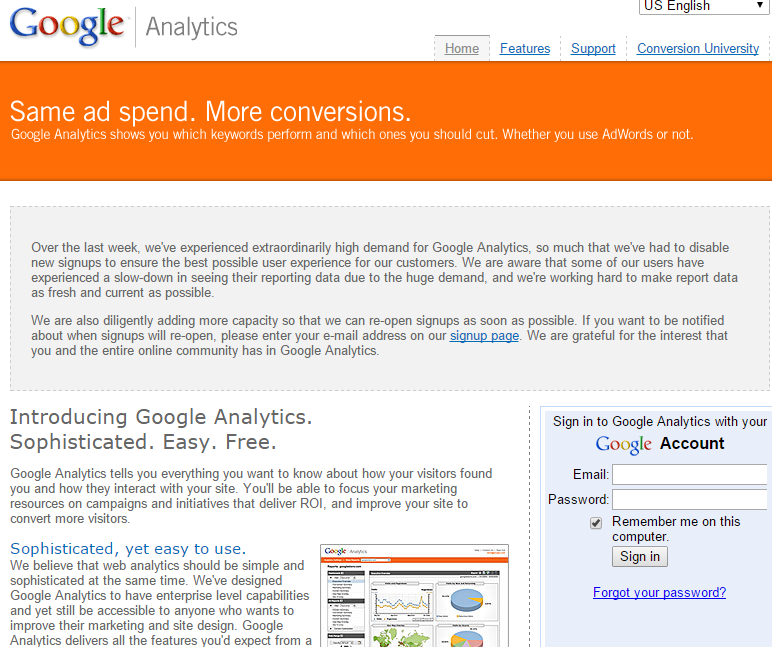 Here is the first design of Google Analytics, which replaced the URCHIN in 2005. Having looked at the history of web analytics, let us take a brief glance at the practical side of things, and how web analytics can help if you are a business or organization. How to unlock your website’s potential through web analytics? First off, if you want to make web analytics work for you and your website, you will need to set the foundation straight. The foundation of all business or organized activity is the setting and streamlining of objectives and aims. Web analytics can only help you achieve that which you know you want to achieve. So having a clear idea of what you are looking to get out of the analysis of a bunch of data is highly important and critical to letting web analytics help your website. The following are some essential steps that ensure your website’s true potential is unlocked with web analytics. You will start by defining goals. The first part includes defining both short-term and long-term goals. They should be closely related to your business and they should describe what you want to achieve. The goals are only a plan, while you will also need to define means necessary to achieve those goals. Try to be very specific when defining goals. Secondly, the goals of your business should be easily measurable in terms of success and failure, progress and delay, as well as efficiency of the specific goals. They also need to be time bound, at least to some extent. Identifying KPIs is an essential step in the analytic process. The choice of these indicators can make or break the entire assessment of how well a website is functioning. The need for relevant KPIs is discussed later in the book. However, it suffices to understand for now that without identifying these indicators web analytics has very little value. Nonetheless, not all Key Performance Indicators are worthy to be considered either. Time and effort has to be invested to make sure the right indicators are chosen and applied to the assessment data. Lastly, a web analyst should segment the data before it becomes an input for metrics and KPIs. In this context, segmentation means that the data is grouped and divided into categories that define where visitors came from, what they did and what actions were accomplished. Acquisition – Acquisition includes everything that a webmaster does to attract visitors to the website. This data will take into account the banner ads, pay-per-click marketing, search engine optimization campaigns and emails for web promotions. Behavior – Behavior includes all the activities performed on the website. It takes into account clicks, downloads, browsing and viewing links and pages via the website. Outcomes – Outcome data includes valuable results that a business wants its visitors to yield. It takes into account actions like subscribing to newsletters and other services by the business. Making sure web analytics is useful for your website is an entire procedure in itself. Hence, it is necessary that you go through each of these steps with utmost caution because they set the stage for the analysis to begin. Being patient and thorough at every step is the key to making sure that your website’s profitability is positively affected. How web analytics can help your business grow? Throughout the course of this book, you will read about the various benefits of web analytics and the many ways it has helped webmasters gather insights about how well their website performs. Owing to intense competition in the online realm, even the most basic website needs to have thoughtfully planned features and layouts so that it attracts significant online traffic. How many visitors visit the website every day? Where do they find the website? Do they use organic or paid sources? Do these visitors take action? How much time do they spend on the website? Which pages do they stay on the most? Do they use keywords or are they referred? Which pages are the most and least visited? Are your pages indexed by the search engines? 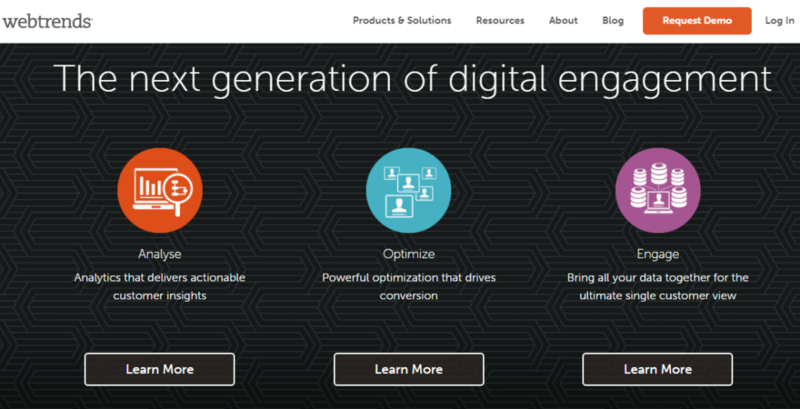 Are the entry and exit pages turning visitors into customers? What can be done to increase conversions? Which websites refer the most traffic to your pages? Which parts of the website are not delivering as expected? Is there room for improvement on your website? Since businesses have increased their spending on online marketing and e-commerce, web analytics has become even more important for business growth. However, no matter how much you spend to build a website, unless you know how well it is performing, there is not much you can do to increase profitability and efficiency. It is the knowledge about all these important topics that makes web analytics such a valuable tool for business growth, especially in the face of such tough competition on the internet.